Made with the same vegetable oils used to formulate oil colors — namely linseed, safflower, and poppy — drying oils are used to modify the consistency and drying time of oil paints in much the same way as prepared mediums. The different methods of processing these oils results in a range of various drying rates, consistencies, and colors. 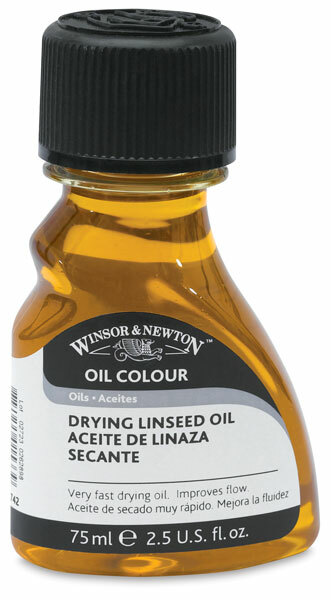 Refined Linseed Oil — Winsor & Newton's most popular oil offers many of the same qualities as Winsor & Newton Cold Pressed Linseed Oil, but is slower-drying. Refined Linseed Oil is an alkali-refined oil of pale color that reduces oil color consistency and increases gloss and transparency. Cold Pressed Linseed Oil — Winsor & Newton Cold Pressed Linseed Oil is a slightly yellow oil that is extracted without the use of heat. Add it to colors to reduce their consistency, improve flow, and increase gloss and transparency, while reducing brush marks. Cold Pressed Linseed Oil dries slightly quicker than Winsor & Newton Refined Linseed Oil and may exhibit better flow with some colors. Linseed Stand Oil — Winsor & Newton Linseed Stand Oil is a pale, viscous oil that can be mixed with turpentine or white (mineral) spirits to improve the flow and leveling of oil colors. It retards drying but imparts a tough, elastic finish. Well-suited for glazing and for fine detail, Linseed Stand Oil is resistant to yellowing while increasing the durability of the film. This is the best oil to use as an additive medium. Thickened Linseed Oil — A pale refined oil of syrupy consistency, Winsor & Newton Thickened Linseed Oil speeds drying time even more than Winsor & Newton Bleached Linseed Oil. It improves flow and gloss, and increases the durability of the film. This oil behaves like Linseed Stand Oil but dries quicker and darker. Refined Safflower Oil — A pale, very slow-drying oil ideally suited for use with white and pale colors, Safflower Oil improves the flow of oil paints while also increasing their gloss and transparency. This oil is best used on its own, as it may cause cracking if overpainted with linseed oil. Drying Linseed Oil — Darker in color than Refined Linseed Oil, Drying Linseed Oil promotes the fastest drying rate of all the Winsor & Newton oil mediums, while also increasing gloss. Drying Poppy Oil — The palest of all the drying oils, Poppy Oil is specially formulated for use with white and pale colors. It reduces the consistency of oil paints while increasing their gloss and transparency. It also resists yellowing and is enhanced with siccatives to increase the drying speed of this naturally slower-drying oil. Winsor & Newton Drying Oils — What's the Difference? 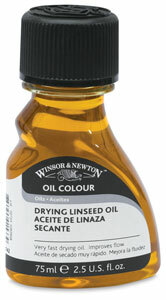 This video explains the differences between Winsor & Newton Refined Linseed, Linseed Stand, and Drying Linseed Oils. Understanding what each of these mediums will do can help you achieve successful oil painting technique.